Today, a delicious break from art history and painting. Risotto with eggplants and black olive tapenade is a recipe created by walkthearts and offered during our art workshops in Provence. We hope that participants of our upcoming Atelier Provence 2014 (July 5-15) will enjoy it! For this recipe, we use high quality ready-made tapenade (easy to find all over in Provence). However, you can also prepare it from scratch using one of the many recipes available in Internet. • A few basil leaves 1. Slice the eggplant in medium slices. Place the eggplant in a colander, sprinkle with salt and let drain for 30 minutes; rinse and pat dry. 3. Heat 2 tbsp of olive oil in a skillet and golden the garlic stirring constantly. 4. Put the eggplant slices on a well-oiled baking pan, spread evenly the mixture of olive oil and garlic and add kosher salt and black pepper to taste. Bake for 45 minutes. 5. In the meantime bring the stock to a boil, cover and keep warm. 6. When ready, process the eggplants until purée. 7. Heat 3 tbsp of olive oil in a saucepan and slowly melt the butter. 8. Add the onion and the anchovies and cook over low heat, stirring occasionally, for 5 minutes. 9. Add the rice and cook, stirring until the grains are well covered. 10. Pour in the wine and cook until it has evaporated. 11. Add a ladleful of the hot stock and cook, stirring, until it has been absorbed. 12. Continue adding the stock, a ladleful at a time, and stirring until each addition has been absorbed. This will take around 18-20 minutes. 13. Add the eggplants to the risotto halfway through the cooking time. 14. 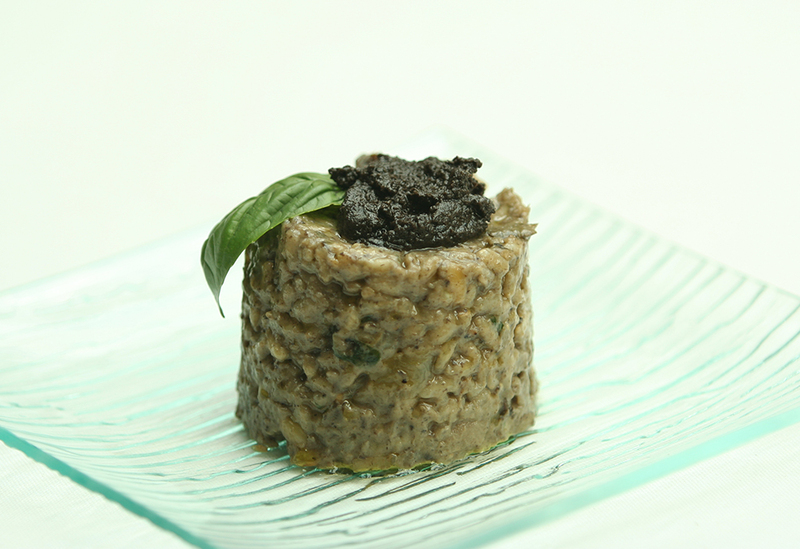 When the rice is almost tender, stir in the black olive tapenade, the parmesan cheese, the basil leaves and the pine nuts and mix well. 15. Taste and season with salt and pepper if necessary. 16. Remove from the stove and cover until ready to serve.Garnish with olive paste and a basil leaf.